When you’re holding an umbrella to protect yourself from the rain, at least one of your hands is typically occupied holding the umbrella handle. That means that doing anything else with your hands is pretty much out of the question. The Brolly is an umbrella with a difference that makes it possible to keep the rain off of you while still texting, emailing or playing phone games on the go. Instead of the standard pole and small, cylindrical handle, the Brolly has a finger grip to hold onto. Fingers slip through the holes, brass knuckle-style, to provide a secure and stable grip. 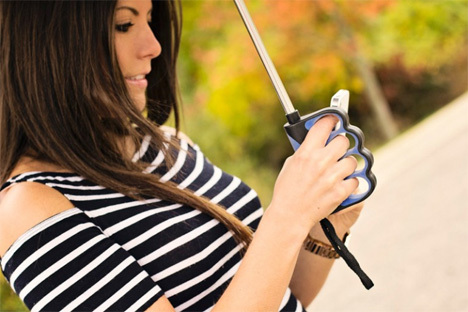 This added stability means that users can hold the umbrella and still use their thumbs for cell phone stuff. 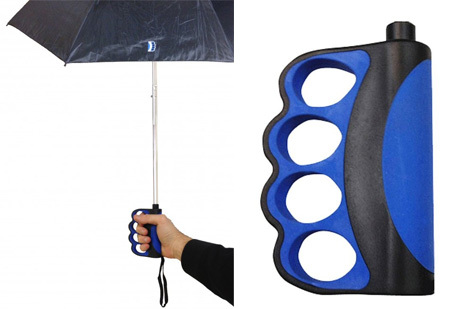 Besides being perfect for people who want to text in the rain, the Brolly offers a welcome design change for people with arthritis and other hand ailments that make gripping small objects difficult. The Brolly is available to order now for about $20.